Imperial Island 2: The Search for New Land is rated 3.4 out of 5 by 37. Rated 5 out of 5 by pennmom36 from Not As Good As The First But Still Top Notch Match 3 fans you can play this game in Casual for a relaxing game or choose Timed mode to get the blood pumping! There are many of the same features as in Empire, such as making matches below Airplanes, Ships and Carts, and then filling them by making matches of a specific item. 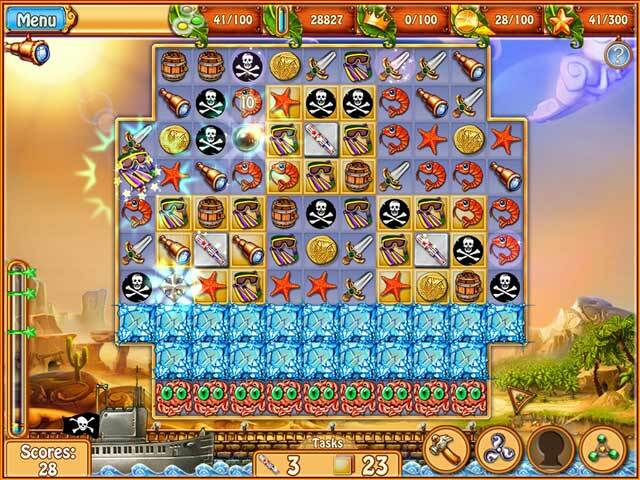 The object of this game is to complete tasks given for each level, by swapping tiles to make a match 3 or more. There are Chests filled with gold that will give you a reward once they drop to the bottom of the board, Jellyfish that need to be freed by destroying tiles next to them, tiles that are Icy, Sandy and made of stone that can be destroyed by making matches next to them, Chained tiles with single and double chains requiring a match next to them either once for single twice for double chains, and Keyholes that need a match next to them to unlock a hidden playing field. As you progress through the levels you will earn different bonuses that will appear on the board each time you make a match of 4 or larger. There are Bombs that blast an area within 1 cell from the center, Silver Lightning that will burn a cross formation of 3 cells, Directional Arrows that shoot 3 cells in the direction of the arrows, White Sparks that will allow you to use your bonuses, and several variations such as Combo mode that will allow you to quickly match 3 or more of the same type of tiles for 10 seconds which will give you a box of dynamite. 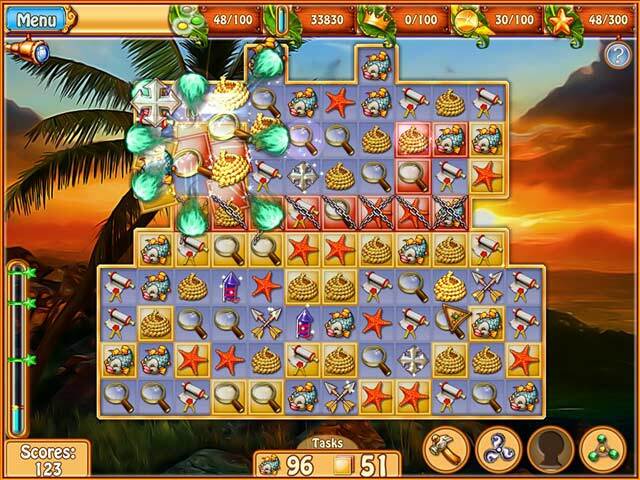 Other bonuses or tools that you can access and choose where and when to use are Hammers to remove any one specific tile, Magic Balls which add random bonuses onto the board, Shuffles which mix up all the tiles and relocates them, and a Collector that collects all the chips from the board of the same kind. This game comes with a book of Secrets as well: Try to destroy tiles at the bottom first which will cause chain reactions and destroy tiles at the top as well: Move the Carts, Airplanes and Ships to the bottom quickly, then clear chained and blocked tiles: Construct new buildings which will give you new, more valuable tiles for resources: Charge the bonus meter before completing a level if possible: The faster you complete a level, the more bonus resources you will earn for the remaining time. I think I've covered all the basics so get your Match 3 game on and enjoy! Rated 5 out of 5 by nelliebj from Good sequel Played the demo and bought it. I too prefer the original only because you can build things. Not a big deal. The second is fun too. I do wish someone had told me about the Spaghetti Monsters! One level, I had to restart because I had nothing I could move and the monsters took over so much of the board I only had a few blocks left. So I restarted that level and finished it that way. Seemed a little unfair to me. Every click I made resulted in 6 monsters! That was not in the first one. But it's fun, it's challenging enough to hold my interest and has an untimed option (yay) but with the monsters, you have to work fast, with or without a timer!! Rated 5 out of 5 by blueteal44 from Finally a new version I loved the original game,but I suggest you try the original then play this as you will understand the game version now available regards playing it. This is an over due release for a brilliant game. Rated 5 out of 5 by TeachumWell from Could This be Match 3 Heaven? I've played lots of match 3's in recent years andmany are outstanding. This one, however, is exceptional. The colors are clear, bright and the objects clearly visible on the background tiles. The cursor moves smoothly and reacts well. Bonuses are partly familiar and many are new variations. The overall graphics while cartoonish perfectly suit the tone of the game. The music is acceptable but can be turned off if desired. The challenges aren't so much the actual matching but the strategy needed to finish each level with the best rankings. Trophies are appropriate and take some time to reachtheir gold level. The story is, well, about what can be expected for a m3 game but with brief bubbled conversation between levels, the plot moves along. Having played the first installment isn't necessary to enjoying this one. While there isn't building as such, there are challenges aplenty. In sum, this is a super m3 and I recommend it to both novices and experts as there's something for everyone. A clear tutorial, good "learning curve" and finding a missing prince. Could one ask for more? Looking forward to episode 3, devs! A great job and a large "thank you" to BF for offering this game! Rated 5 out of 5 by derbeader from Great sequel imo After reading first three reviews this morning, i was a bit skeptical about downloading, then decided to see for myself if this is a good sequel or not. Have now played most of my hour trial, and just prior to sitting here writing this review, i used my credit to purchase the game... it is a good one to have in the repertoire! Yes, there are no buildings to build, and yes i loved the lovely graphics of the first one... however, as with any empire, one must expand, explore... and this sequel gives the challenge by requesting amounts of particular items be gathered before the level can be passed. 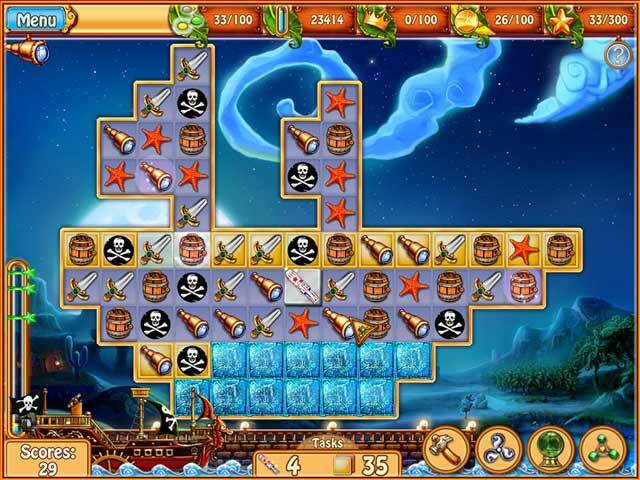 This requires a bit more thought than simply moving a ship or treasure chest to the bottom of the chart. i'm finding myself challenged by having to plan the moves, yet be quick about it. Some levels i've had to repeat, simply because the challenge i've set for myself requires THREE stars before moving to the next. YES-- i recommend this game to all M3 gamers... it is not boring one bit. Rated 5 out of 5 by biscuitsmama from A Great Game but Doesn't Measure Up! 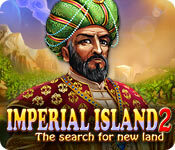 Imperial Island the Search for New Land is a sequel to what I think is an excellent game – Birth of an Empire. However as so often happens with sequels, IMHO, this one pales in comparison to the first game. The graphics in The Search for New Land are very good but they are a departure from those in Birth of an Empire in that they have added cut scenes that do nothing to enhance the game. I far prefer the animated graphics in the original game to these, which seem at times flat. Another thing that I definitely don’t like is when I am at the home screen I see the whale in the lagoon that seems like it is in distress as it undulates up and down. Unfortunately, the whale put me off so much that I hated it when I would complete a match 3 level of the game and had to return to the main screen. We also have voiceovers in this game and I did not care for the narration. Again, and this is just my opinion, the developer would have done themselves a favor by skipping the narration at the beginning of the game. Once I get away from my feeling about the graphics, I find the gameplay is fun and seems to be a bit more challenging than in the first game. Of course, any time I am presented with the challenge of achieving gold stars in a game, it is game on for me since I always want the three gold stars. We do have the option of playing the game in casual or timed mode, a wonderful option as I hate time-management or playing “beat the clock.” Overall, I think Imperial Island the Search for New Land Is an excellent match 3 game but somehow it just isn’t as appealing to me as the first game in the series. If another sequel comes along, I hope the developer returns to the format of the first game. There are things about this game that are very appealing but for me with the change in graphics style I will most likely give it a pass. I am sure that there are many gamers who will absolutely love this game, and I recommend that you try the demo and decide whether this is a game you will like.